Apis mellifera, image by Muhammad Mahdi Karim via Wikipedia Commons. Honeybees are well known for their sting, but scientists have discovered that they also have a bite that stuns. 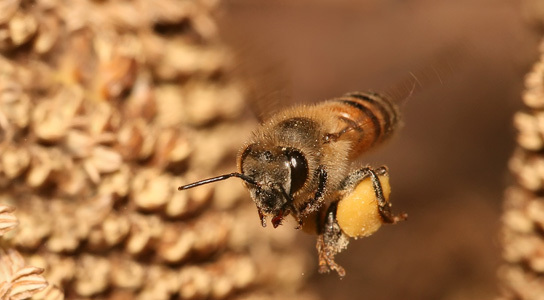 Bees resort to biting when faced with pests, such as parasitic mites, that are too small to sting. The scientists published their findings in the journal PLoS ONE. A close study of the biting behavior has revealed that they secrete a chemical in their bite that stuns pests so that they can be ejected more readily from a hive. 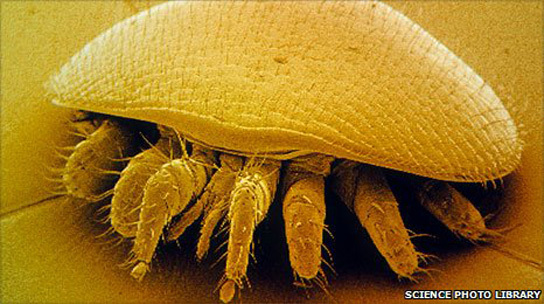 The honeybee varroa mite, image by Science Photo Library. Chemical tests show that this venom could be used as a local anesthetic in humans. Bees were thought to use their mandibles to groom rather than bite. Honeybees bite varroa mites as well as wax moth larvae. Varroa mites are endemic throughout feral and cultivated honey bee colonies. If the population of mites is left unchecked, it can sap the strength of the worker bees, making them more susceptible to viruses, disease or other debilitating conditions. Wax moth larvae burrow through the comb in hives, which eventually destroys the cells where broods are raised and honey is stored. The venom is known as 2-heptanone. Soon after pests are ejected from the hive, they start wriggling again. 2-heptanone is so volatile that it quickly loses its potency. It could be used as an alternative to treatments like lidocaine, which can provoke allergic reactions in some patients. Humans cannot be bitten by bees. Their mandibles are too small, so they can only be used on smaller organisms. Be the first to comment on "Honeybees Have a Bite that Stuns"